The following is excerpted from an excellent article by Michael Torrice in Chemical & Engineering News. It gives a concise and clear explanation of the procedures that city water departments use to keep contaminants like lead, copper, and iron in the pipes and not in the water, and it shows how fragile this system is and what happens when, through ignorance, greed, or lack of concern, water officials fail to follow the rules.–Hardly Waite. Lead contamination is the most troubling in a series of water problems that have plagued Flint since the summer of 2014. All of them were caused by corrosion in the lead and iron pipes that distribute water to city residents. When the city began using the Flint River as its water source in April 2014, it didn’t adequately control the water’s ability to corrode those pipes. This led to high lead levels, rust-colored tap water, and possibly the growth of pathogenic microbes. Before 2014, Flint was getting its water from the Detroit Water & Sewerage Department, which would draw water from Lake Huron and then treat it before sending it to Flint. Looking to lower the city’s water costs, Flint officials decided in 2013 to instead take water from the Karegnondi Water Authority, which was building its own pipeline from the lake. As an interim solution, while waiting for the new pipeline to be finished, Flint began taking water from the Flint River and treating it at the city’s own plant. Problems with the city’s tap water started the summer after the switch. First, residents noticed foul-tasting, reddish water coming out of their taps. In August and September, the city issued alerts about Escherichia coli contamination and told people to boil the water before using it. A General Motors plant stopped using the water in October because it was corroding steel parts. In December, the Michigan Department of Environmental Quality notified Flint that its water was in violation of national drinking water standards because it contained high levels of trihalomethanes, toxic by-products of chlorine disinfection. Then, in early 2015, reports of high lead levels started making news. In January, it was Flint’s University of Michigan campus; in February, it was a private home. By early September 2015, a Virginia Tech team had sampled water from 252 homes and reported on their website, flintwaterstudy.org, that the city’s 90th percentile lead level was 25 ppb. EPA’s action limit is based on a 90th percentile calculation, meaning that if 10% of homes exceed the agency’s 15-ppb threshold, then action is required. That same month a team led by Mona Hanna-Attisha, a pediatrician at Hurley Children’s Hospital, in Flint, released data showing that the number of Flint children with elevated levels of lead in their blood had increased since the water change. In areas with the highest lead concentrations in the water, about 10% of the children had elevated blood levels of the element. Lead is neurotoxic and can disrupt children’s development, leading to behavioral problems and decreased intelligence. With evidence of lead contamination mounting, Flint switched back to the Detroit water in October. Why did the switch to Flint’s river water cause this catastrophe? To understand the problem, consider that as water travels through the miles of pipes in a city’s distribution system, molecules in the water react with the pipes themselves. “The distribution system acts like a geochemical reactor,” says Haizhou Liu, an environmental engineer at the University of California, Riverside. 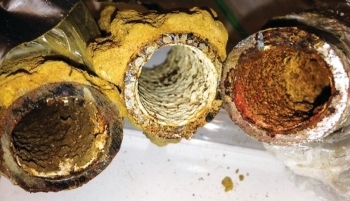 “There are miles and miles of pipes—some iron, copper, and lead—that get corroded.” This corrosion occurs when oxidants, such as dissolved oxygen or chlorine disinfectant, react with elemental iron, lead, or copper in the pipes. Cities no longer install lead pipes. 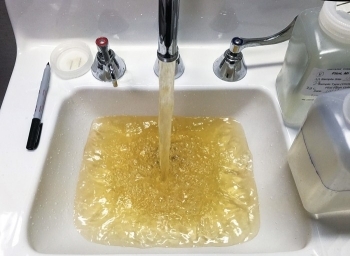 But older cities such as Flint still rely on them, usually as service lines that connect water mains in the street to a home’s water meter. A 1990 report from the American Water Works Association estimates there are millions of lead service lines in the U.S. To limit how much lead leaches into the water from these pipes and some homes’ plumbing, EPA’s Lead & Copper Rule requires water utilities serving more than 50,000 people to establish a plan to monitor and control corrosion. As part of these plans, utilities treat their water to maintain a mineral crust on the inside surfaces of their pipes. This so-called passivation layer protects the pipes’ metal from oxidants in the water. The coatings consist, in part, of insoluble oxidized metal compounds produced as the pipe slowly corrodes. If the water’s chemistry isn’t optimized, then the passivation layer may start to dissolve, or mineral particles may begin to flake off of the pipe’s crust. This exposes bare metal, allowing the iron, lead, or copper to oxidize and leach into the water. In Flint, the water chemistry was not optimized to control corrosion. Most important, the treated Flint River water lacked one chemical that the treated Detroit water had: phosphate. Cities such as Detroit add orthophosphate to their water as part of their corrosion control plans because the compound encourages the formation of lead phosphates, which are largely insoluble and can add to the pipes’ passivation layer. The entire Flint water crisis could have been avoided, experts believe, if the city had just added orthophosphate. In experiments using the city’s water, simply adding a phosphate corrosion inhibitor sharply reduced the amount of lead leached from pipes. Still, orthophosphate isn’t the only corrosion solution. Some water utilities treat water so it has a high pH and high alkalinity. Such conditions decrease the solubility of lead carbonates, which also contribute to the pipe’s protective mineral layer. The treated Flint River water had a relatively low pH that decreased over time. According to monthly operating reports from the Flint treatment plant, the city’s water had a pH of about 8 in December 2014, but then it slowly dropped to 7.3 by August 2015. Environmental engineers say that if water pH drifts too low in the absence of orthophosphate, the water can start to leach high levels of lead from pipes. The pH drop over time seems to indicate that plant operators in Flint didn’t even have a target pH as part of a corrosion plan. Water utilities usually find a pH that’s optimal for preventing corrosion in their system. For example, in Boston, another city with old lead pipes, average water pH held steady around 9.6 in 2015. Another chemical factor that contributed to the treated river water’s corrosiveness was its chloride concentration. The treated Detroit water’s average chloride level was 11.4 parts per million in 2014. The treated Flint water had 85-ppm chloride in August 2015. The plant may have contributed to these high levels when it tried to address high levels of toxic trihalomethanes. Disinfection by-products such as trihalomethanes can form through reactions between organic matter in water and chlorine disinfectant added at treatment plants. The Flint plant had increased the amount of chlorine it used in the summer of 2014 to combat the E. coli contamination problem. To reduce levels of trihalomethanes that formed, the plant removed organic matter from the water by adding ferric chloride, which coagulates organic matter, making it easier to filter out. Even though the treatment took care of the trihalomethanes problem, it increased the water’s chloride levels. Environmental engineers worry about high chloride levels because studies have shown that lead corrosion is more likely when the ratio of chloride to sulfate concentrations is greater than 0.58. Researchers at Virginia Tech calculated the ratio for treated Detroit water as 0.45 and for treated Flint River water as 1.6. Corrosion of lead pipes caused Flint’s most serious water issue, but corrosion of the city’s iron pipes also created problems. The chemistry that controls iron pipe corrosion is a little more complicated than the chemistry surrounding lead pipe corrosion, but some of the same factors play a role. 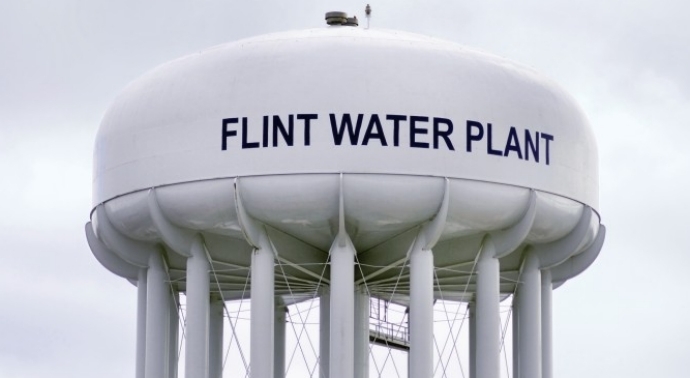 Problems with Flint’s iron pipes started early: The rust color and bad taste of the water coming out of residents’ taps in the summer of 2014 was a sign that the passivation layer on iron pipes was dissolving into the water. But the issue that worries environmental engineers most about iron corrosion is that it could encourage the growth of pathogens in the distribution system. As the mineral layer in iron pipes falls off, it exposes bare iron that can reduce free chlorine added to the water as a pathogen-killing disinfectant. Some homes had no detectable chlorine levels when monitored. Another issue could have worsened both the corrosion and disinfection problems. Much of the distribution system was built when the city’s population was about 200,000 and Flint was a major manufacturing center. But the city now has less than half the population, and much of the industry, which used a lot of Flint’s water, has left town. As a result, water usage has dropped significantly, while the system’s capacity has remained the same. This means that water sits in the distribution system for long periods. In some places, the water sits in pipes for more than six days before use, providing more time for reactions that corrode pipes and break down chlorine. Now that Flint has switched back to the Detroit water, environmental engineers believe that it may take months to a year for pipes to regain their passivation layers, for corrosion to slow to normal levels, and for lead concentrations to drop back into an acceptable range. The lesson, according to one authority, is that “when we collect data, we need to use those data. Utility officials had all the data they needed about pH, alkalinity, and chloride levels to determine that the water was corrosive. They just failed to act on that information. She points out that the water utility officials were already collecting all the data they needed—pH, alkalinity, chloride levels—to determine if the water was too corrosive. The lesson is that there is an undeniable connection between water chemistry and infrastructure. Reference: How Lead Ended Up in Flint’s Tap Water, by Michael Torrice.